Fill your dining area with a sense of individuality with the Fusion Wooden Chair Charcoal, a modern model with charm and class. Charcoal faux leather covers the padded seat, along with the backrest and armrests that are edged with matching piping and neat stitching. 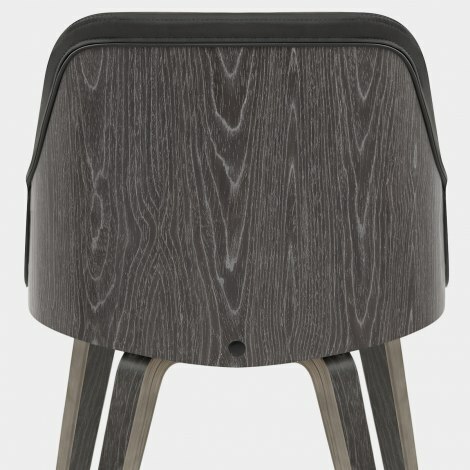 The backrest is encased in a bentwood shell, which boasts a chic antiqued grey finish that enhances and emphasises the grain of the wood for a modern yet natural look. Creating a unified design, the tapered bentwood legs have the same finish, complementing the seat and grey upholstery. Protective pads help to ensure your floors are looked after, giving the Fusion a chance to succeed in a variety of settings. "Comfortable and it looks very nice"
I bought this in combination with the Fusion grey velvet which looks really great at my dining table. This is a lovely chair. It is easy to assemble, comfortable and it looks very nice.